Myron's is the only locally owned and operated prime steakhouse and we take pride in that fact by cooking with only the highest-quality ingredients to ensure every bite of your meal is delightful. We have been recognized multiple times by Wine Spectator, receiving awards of excellence for our extensive wine selection. Myron's offers 350 different labels, including many boutique California wines. Join us for Wine Down Hour everyday from 4 to 6:30 pm where we offer 50% off appetizers, 25% off drinks and wine (bottles under $150). Our modern, chic, Texas-inspired decor creates a unique, casual, yet elegant atmosphere perfect for celebrating special occasions, a romantic evening or enjoying a few glasses of wine with your close friends. Myron's also offers private rooms for business meetings, banquets and private parties. 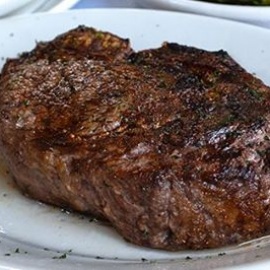 The Been family opened the original Myron's Prime Steakhouse in New Braunfels in 2003 and created a comfortable, elegant restaurant where customers can enjoy a quality steak dinner. They decided to open a second location in San Antonio in 2011 featuring the same quality and luxury of the original restaurant in New Braunfels.